Wink SK is an add-on for skill games. 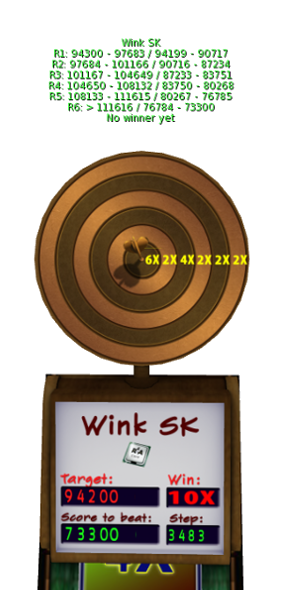 A game with a Wink SK is still the same game, but you will win your prize on the wink SK and not on the game itself. Wink SK shows a score to beat. Beat that score on the game and the Wink starts spinning and will give you a prize. This could be x2 (twice the amount you paid in) all the way up to x100. 1. There are 4 different Wink SK add-ons, each with its own prizes. 2. 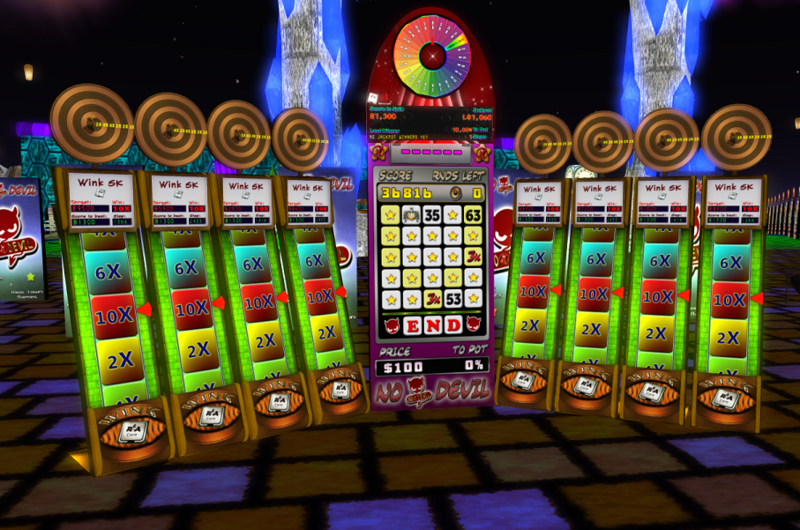 You win when you beat the score to beat shown on the Wink SK. The Wink SK also shows a target score. 3. You have much control over which prize you win. There are 4 different Wink SK configurations you can find in Second Life. The difference is in the range of prizes you can win. Of course, the ones up to x10 will have the lowest score to beat, the ones up to x100 the highest. The Wink SK displays clearly its highest multiplier. For those new at Wink SK, x10 is of course an easier one to start with than x100. x? xWhat? e.g. x10 or also written as 10x is a multiplier. It indicates winning 10x the amount you paid in to the game. Let’s have a look at the top side of a Wink SK. You see a lot of information. 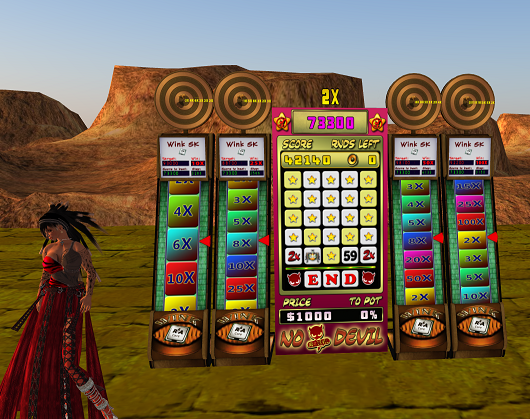 In this example the score to beat is 73300 and the maximum prize you can win is X10 (here displayed as 10X, which is the same). 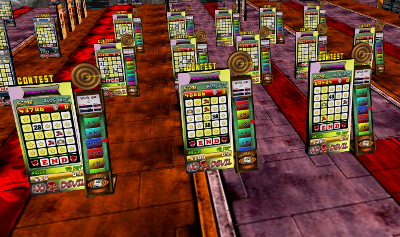 If you manage to score exactly the target score or less than 100 points above the target score you will win the maximum prize, X10 in this example. Otherwise, it will be a different prize. Remember Beating the score to beat is good, cause you will win, reaching exactly the target score or only little above it is splendid: You will win the highest prize. You can always know which prize you will win as soon as you know your score. 1. Adjusted score :Round your score down to the nearest 100. 2. Distance : This is the target score minus the adjusted score. 3. Steps : This is distance divided by the number of steps. 4. Add 1 to Steps and in case it is negative make it positive. 5. Count the rings from the target on the dart board above the wink sk. 6. You will win the prize shown in that ring. 7. In case steps brings you off the board, you win the prize in the outer ring. This looks more complicated as it is. 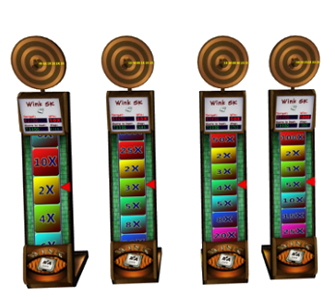 In many cases the higher multipliers are near to the target, keeping an eye on scoring the highest possible prize isn’t that hard at all. To help you avoiding all the subtracting, dividing and counting, Wink SK shows a floating text giving for each ring the score ranges. After your game is finished, target score and steps as well as the distribution of the prizes over the various rings will change. The score to beat will remain as it is. Each game you aim at a different target. Above anything else, beat the score to beat first before worrying about targeting. Play good, play smart. 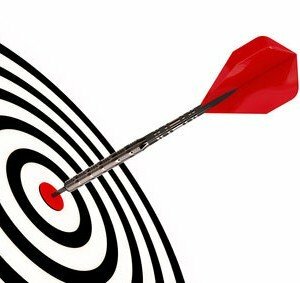 Once that is achieved, you can think about targeting. Aiming on a score that gives a better pay-out But how to do that? The most basic form of score targeting is to stop playing. Just don’t click anything anymore when you reached the target. The game will end after a while, just wait for it, knowing the big cash will come your way. Once the game ends, you get your prize. On a game as No Devil you could consider to take the spider on purpose. When you have the x3 multiplier it will drop to x2, making score go up in smaller steps, thus better to manage. What is the effect of placing a joker? Sometimes you can choose, making 2 lines or just 1 line. Perhaps just 1 line brings you closer to the target. Skip a match that makes a score that is too big, hoping on a smaller score in a next round. In some cases, satisfy for a good but not the highest pay out, avoiding the risk on a much lower payout. Filling the entire board gives a truckload of points. You are sure you want to do that? And so on…Score targeting can’t always be done perfectly but you can go a long way using common sense. We tried to be a bit creative, so we put this setting out….Why not connect 4 Winks to a game, and let that game also play X2. One win, 5 payouts !! You’ll find yourself targeting at multiple targets. What you say? Still not enough. Below is a picture of something we put out at Devlish Dream.